Although dandelions grow wild, and gardeners consider the plant to be a nuisance, dandelion is one of the most nutrient-rich herbs in the plant kingdom. Because of dandelion's versatility, many cultures have used its roots and leaves for centuries to treat medical conditions and for culinary purposes. Dandelion root offers powerful health benefits, and you can use it fresh or dried, in tea, in capsule form or in extracts. Dandelion root contains antioxidants, which are powerful substances that help protect your body from free radicals – the unstable molecules that can damage healthy cells. Studies also show that dandelion root extract has protective properties against alcohol-induced liver poisoning because of its antioxidant power, according to an article published in "Food and Chemical Toxicology" in June 2010. Chemo-resistant melanoma, which is a very aggressive form of skin cancer, has become the most prevalent form of cancer for North Americans in the 25 to 29 age range, according to an article published in "Evidence-Based Complementary and Alternative Medicine" in 2011. The article noted that a study that investigated the effectiveness of dandelion root on melanoma revealed that dandelion root extract has been very effective in the death of melanoma cells. Dandelion root extract is helpful in enhancing digestion, as it contains diuretic properties and therapeutic benefits for people who experience constipation. 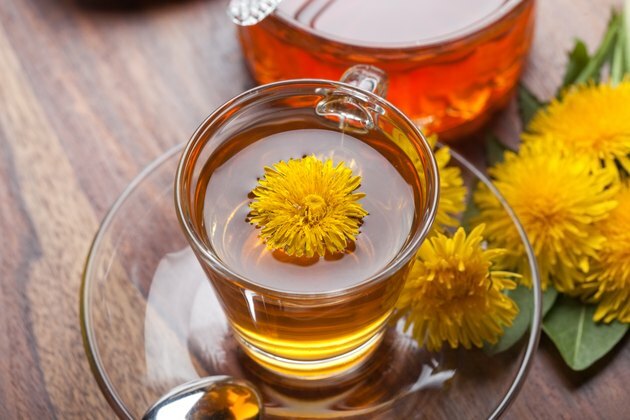 Dandelion root tea is used as a tonic for many conditions related to the digestive system, such as an upset stomach, loss of appetite and intestinal gas. It's also used in treating gallstones. This powerful herb contains substances that may increase urine production and promote bowel movements, according to MedlinePlus. Dandelion is generally considered safe. It can, however, cause allergic reactions when taken orally or if it is rubbed on the skin of sensitive people. People who are allergic to ragweed and related plants, such as daisies, chrysanthemum and marigolds, may be allergic to dandelion, according to MedlinePlus. If you experience allergies, speak with your doctor before taking dandelion in any form. In addition, since medical professionals know little about using dandelion root during pregnancy and breast feeding -- if you're pregnant or nursing -- it's advisable to speak with your doctor before using dandelion root.